Every year our church sponsors Ridge Youth Soccer. 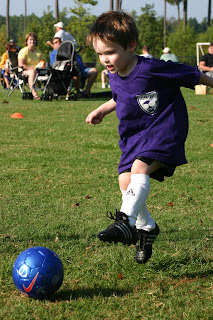 Last year I coached my son's Under 6 team and really loved it. I don't know a lick about soccer except for that the ball with the dots goes in the net, but apparently there were no skill requirements. Tonight I go for training, for Under 8 kids. My guess is that the competition will be a little more serious and all that much more fun. Meanwhile my family is digging around the old family tree and there is a long discussion on the names of some of our roots. So far, my grandfather had three sisters named "Lula, Sula, and Zela" Not only that, but apparently now there is a Jerutha. I feel like I descended from a cheap 1970's gladiator movie. So to bring my story together you can just call me coach.